Thanksgiving weekend so we have given you time off for the weekend! But still lots of great stuff to see next week. Wednesday October 15 The Western Front presents The Muted Note. Unaccompanied trombone and voice boldly interpret the poems of the late P.K. Page through song and dance. Scott Thomson’s suite of songs first developed in 2010 as arrangements for his quintet, The Rent, have since been adapted for an intimate duet specially designed for vocalist/dancer Susanna Hood. Together they fuse word and song with dances choreographed and performed by Susanna Hood, “what emerges is a kind of dance between voice and trombone, between word and sound, a subtle counterpoint between conjoined melodies and ideas of voice, always in close connection to the gestural power of Page’s phrases,” -Stuart Broomer, Music Works, 2013. Following their performance, Governor General Award winner and author of Journey with No Maps, A Life of P.K. Page Sandra Djwa leads a conversation with artists Scott Thomson and Susanna Hood. At the Western Front, 303 E8th Avenue, 8pm. For more info and tix go here. 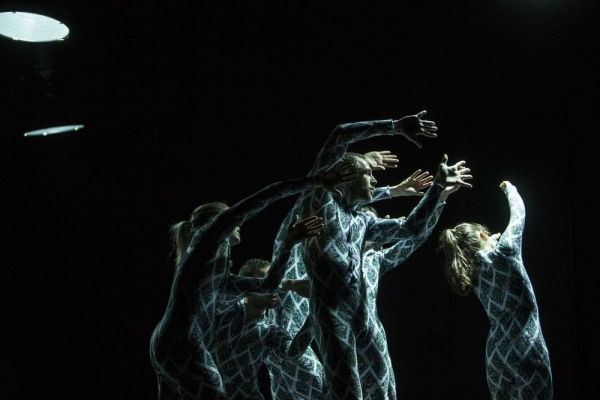 October 16 – 18, as part of the Dance Centre’s Global Dance Connections, comes Compagnie Gilles Jobin (Switzerland), in QUANTUM. Art and science collide in QUANTUM, the result of Gilles Jobin’s artistic residency at the largest particle physics laboratory in the world – CERN in Geneva, where he worked with scientists to investigate principles of matter, gravity, time and space in relation to the body. Six dancers power through densely textured, sculptural choreography, to evoke the subtle balance of forces that shape our world. Illuminated by Julius von Bismarck’s light-activated kinetic installation built from industrial lamps, and accompanied by an electronic score by Carla Scaletti which incorporates data from the Large Hadron Collider, QUANTUM epitomizes the adventurous, searching spirit of artistic and scientific inquiry. Scotia Bank Dance Centre, 8pm. Tix. An evening of 3 contemporary dance world premieres, produced by Karissa Barry and MovEnt. New works by Karissa Barry, Tara Cheyenne Friedenberg and Anne Plamondon, with dancers Karissa Barry, Lexi Vajda and Jessica Wilkie. October 17 and 18, at the Shadbolt Centre for the Arts, 8pm. ~ by DanceHouse on October 10, 2014.